we started out on our field based training with ryan; a volunteer from mopti who taught us for the last week in stage: we met up with betty and dan; two of my soon to be team mates at site: they are both small enterprise dev and live close to my site in tominion: we all stayed at the san stage house and languished there for two days with electricity and a freezer: we caught the bache soon enough for mandiakuy, bettys site. mandiakuy is a bit unusual for a rural, backroad village in mali. it has a huge cathedral which looks slightly out of place in the middle of small mud huts, dirty pigs and millet growing around it. the market right down the path is the home for a dozen half naked, toothless old women who love to yell out there bobo greetings to you and offer you a spoonful of peanut butter from their buckets. sometimes it is dried onions. the people are very nice out here and i can practice my bore. betty works for the mayors office. we went over the budget and projects and long range plans and spoke about what his duties to the community are. they had many ideas that they wanted to initiate concerning market extensions, educational programs and income genreating projects, such as new garden groups and livestock investment. the only project they have successfully completed this year was the remodeling (put new concrete walls up) of the mayor's office. we also met with some very motivated women from an association that Betty works with. they began the group when they were young, making shea butter and selling the limited product in the market once a week to buy new fabric and throw parties. they have evolved now to a larger association that supports a large income of these women's families and helps with large loans for sick family members. doie is radana's village. she is an older volunteer who immigrated to the states from czech republic. she introduced us to the bobo love; pastisse. it is very strong and smells really bad. but the people in bobo land love to drink it. we had a bobo lunch. one of my fellow trainees slaughtered a lamb for us to eat. (it was a gift from the village), then we were obliged to have several cups of the licorice drink. after an hour or more of lamb butchering and cooking and many cups of pastisse, the bobo lunch turned into quite a party and the language barrier was not so difficult as it was at first. that is until they introduced us to the women's group right afterwards with whom we were supposed to do a project study with.... i wish they told us that before the pastisse. turned out that they had set into motion a sheep raising venture and were going to market the next week to sell their fattened lamb for Tabaski (when God took the sacrifice of a lamb instead of his Abraham's son). the project looked great and they stood for a nice profit if they bargained right at the markets. 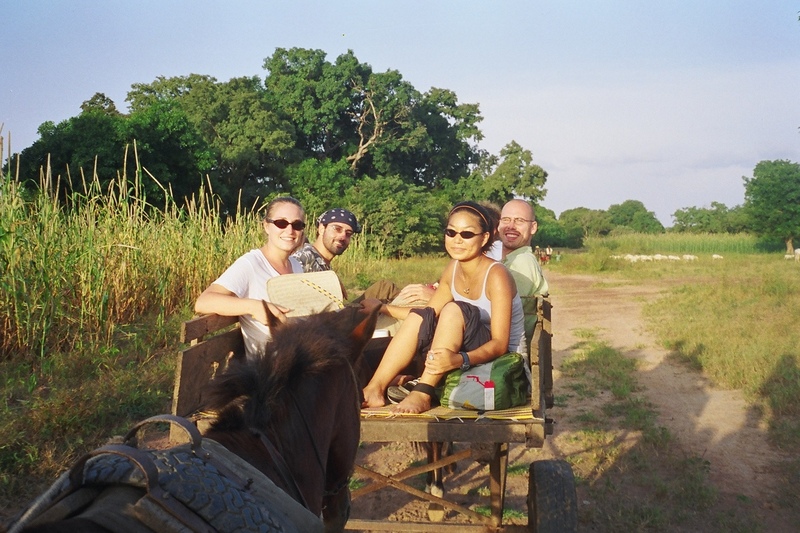 we left doie soon after that on our donkey carts and headed 4 hours back to mandiakuy. unfortunately, my donkey cart blew a tire and we had to get off at a village in between and switch carts. we didn't get home until late. Going to san was like paradise. we had clean beds and a refridgerator and electricity and fans. it was wonderful. even though we had gone their for a dirty job. we got to build a soak pit for one of the local san residents. this job is really a job of endurance and strength. i will go into it on a later day, and if you talk to my mom she might show you a picture of me digging one out. it is lovely. suffice it to say, the job took 2 days, we hit rock. but it is completed and several people on the block have asked that we come back. i told them that they would have a wonderful water san volunteer soon and they should go ask him.... hahaha desmond, i hope you read this! (desmond is another team mate). fbt was great. i was exceptionally lucky to be on training with 2 of my team mates in the segou/boboland region. so i got to know a lot about them and the work they have done in the area. we now only have 2 more weeks of horrible stage and we move on into site. i can't wait.